Marine 31 Skin-Soft Hand Cleaning Wipes eliminate 99.9% of disease-causing germs and bacteria from skin. Perfect when soap and water aren�t available, Marine 31 Skin-Soft Hand Cleaning Wipes gently remove grease and grime without drying out your skin. A single tub contains 70 towels, each of which is fortified with natural emollients and soothing oils to prevent chapping. Try to find a better way to clean, sanitize and moisture your hands while out on the open water! Very few things in life are as enjoyable as catching, seasoning and grilling a fish while out on the open water. While that�s arguably every boater�s ideal way to spend a Sunday afternoon, a lot of people overlook the fact that fish, whether from the ocean or fresh water, are covered in disease-causing bacteria. If you don�t properly clean and sanitize your hands after reeling one in, you put yourself and your family at great risk for illness. Marine 31 Skin-Soft Hand Cleaning Wipes eliminate 99.9% of disease-causing germs and bacteria, ensuring you and your family stay safe. Not all hand cleaning wipes are created equal! Marine 31 Skin-Soft Hand Cleaning Wipes are constructed of a durable, non-abrasive fabric that is gentle for those with sensitive skin. The built-in moisturizers and emollients condition and soften hands to prevent chapping. The fresh wintergreen fragrance eliminates any unwanted odors as you clean. What more could you ask for from a hand cleaning wipe! Marine 31 Skin-Soft Hand Cleaning Wipes are a must if you take small children boating with you. It�s no secret that kids love sticking their fingers and foreign objects in their mouth. Fortunately enough for you and your children Marine 31 Skin-Soft Hand Cleaning Wipes eliminate 99.9% of disease-causing germs and bacteria without drying out or chapping skin! Your kids will love the fresh wintergreen fragrance too! 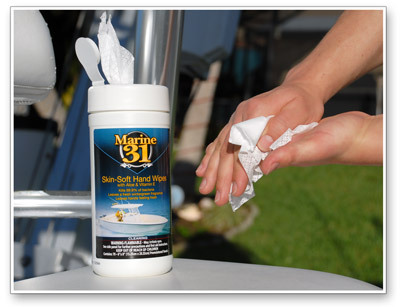 Marine 31 Skin-Soft Hand Cleaning Wipes are harbor-safe and eco-friendly.